Located in Hermon, the Northern Maine Junction is where the Pan Am and Montreal, Maine & Atlantic rail lines meet. BANGOR, Maine — The railroad industry’s ability to move huge volumes of goods over long distances is also its biggest enemy in Maine, where a dwindling manufacturing base means customers who need rail transport are becoming too few and too far between. That reality nearly changed northern Maine forever when the Montreal, Maine & Atlantic Railway announced two years ago that it would abandon 233 miles of tracks in northern Maine that serve some of Aroostook County’s largest employers. Taxpayers presumably saved the rail line in June 2010 by approving $7 million in borrowing to purchase the tracks. The Maine Department of Transportation is now in the process of selecting a railroad company to keep trains rolling. Moulton said approximately 20 railroad companies have been tracking the process, which he hopes will conclude with the selection of one of them by mid-June when Montreal, Maine & Atlantic Rail’s commitment to operating the rails ends. Joe McGonigle, MM&A vice president of marketing, said his company, attracted by the prospect of continuing service in northern Maine without the considerable expense of owning and maintaining the ailing tracks, might be one of the bidders. Whoever takes over, he said, will face the same problem that the MM&A grappled with: too little volume from too few customers who are too far apart. It’s not an easy problem to fix, and McGonigle has concerns about rail’s long-term fate. 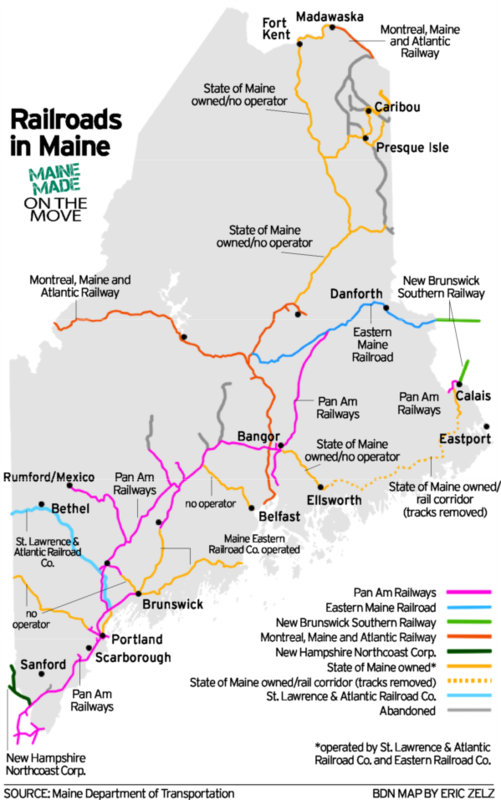 In 2005, MM&A moved approximately 50,000 rail cars in and out of Maine. By 2010, that number had dropped to about 30,000 rail cars. McGonigle said the closure of paper mills and sawmills over the years was compounded by the economic downturn of 2008. Another culprit, he said, is a quickening trend of businesses keeping less inventory on hand. Lower stock levels generally translate to smaller shipments that have to arrive more quickly — which are two things for which rail is not best suited. Bill Cohen, a spokesman for Verso Maine, which operates paper mills in Bucksport and Jay and is served by Pan Am Railways, said his company slowly has shifted away from rail over the years. While rail once dominated the equation, about 55 percent of Verso’s incoming materials and outgoing products now are moved on trucks. A major contributor to that shift was the factor identified by McGonigle: Companies keeping lower volumes of stock. Vaillancourt of Fraser Timbers agreed. He said everything from a shortage of box cars to harsh winter weather have delayed shipments. This winter alone, said Vaillancourt, there have been three train derailments in Maine which had Fraser products aboard. With the price of fuel rising, Vaillancourt said he expects to pay more to move product, whether it’s on rails or roads. Cynthia Scarano, vice president of Pan Am Railways, which operates more than 300 miles of tracks in Maine, said her company is aware of customers’ needs for reliability and efficiency. In the winter months, one of the biggest challenges is weather, which in the past several months has caused at least two of three derailments of Pan Am trains. 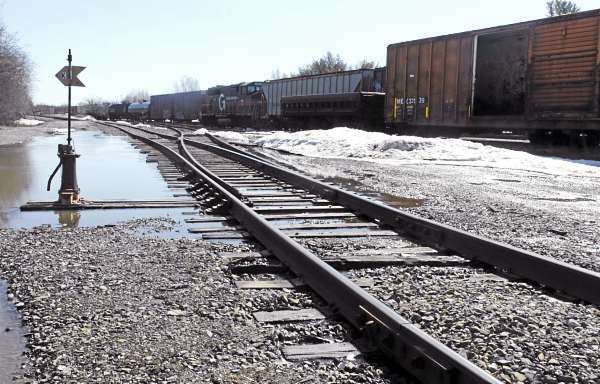 The cause of the most serious incident, when more than a dozen cars slipped off the tracks in Readfield on Feb. 6, has not yet been determined. Scarano says she sees brighter days on the horizon for her company. In the past several months business has rebounded so much — particularly from paper companies, she said — that the company is trying to reverse a downsizing it underwent early last year. Business had fallen by about 32 percent, but started to improve in May 2010, which caught Pan Am with a shortage of engineers and conductors. Since then the company has trained 40 new personnel. Scarano said Pan Am also is making improvements to its infrastructure with an eye toward increasing reliability. For example, the company is in the midst of a collaboration with Norfolk Southern railroad to spend $90 million on improvements to the lines, switching stations, loading machinery and bridges between Ayer, Mass., and Mechanicville, N.Y. Though the project is hundreds of miles away from many of Pan Am’s Maine customers, Scarano said the project’s impact will be felt here. McGonigle agreed and said Montreal, Maine & Atlantic also is analyzing its operations to find ways to improve service. He said he anticipates the focus in terms of growth will be the forest products industry. The state is doing its part with the development of a long-awaited State Rail Plan, a draft of which will be released in the coming months, according to Moulton. Though he wouldn’t say what the plan will contain, he said it will serve as a blueprint for the steps necessary to sustain rail service for the Maine businesses and communities that depend on it.